Our products are various from fresh coconuts for beverage especially ring pull coconut and fresh diamond coconut. 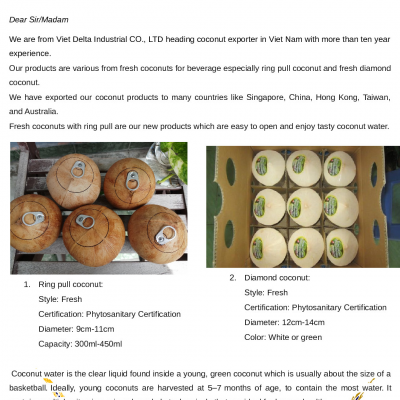 We have exported our coconut products to many countries like Singapore, China, Hong Kong, Taiwan, and Australia. Fresh coconuts with ring pull are our new product which are easy to open and enjoy tasty coconut water. Coconut water is the clear liquid found inside a young, green coconut which is usually about the size of a basketball. Ideally, young coconuts are harvested at 5–7 months of age, to contain the most water. It contains multiple vitamins, minerals and phytochemicals that are ideal for human health. Please kindly to contact us for more information with the best price!! !